RED CROSSBILL: Red Crossbills will be scarce this winter. Watch for them in pines. Red Crossbills comprise about 10 "call types" in North America. The western types seen last winter in the East have probably returned to their core ranges in western North America. Most types are impossible to identify without analyzing recordings of their flight calls. Recordings can be made with an iPhone and identified to type. Matt Young (may6 at cornell.edu) of the Cornell Lab of Ornithology will identify types if you email him your recordings or upload them to an eBird checklist. This helps his research. Recordings uploaded to eBird checklists are deposited in the Macaulay Library. See link #4 for Matt’s guide to Red Crossbill call types. BOHEMIAN WAXWING: A good flight south into settled areas is expected because native Mountain-ashes in Ontario and Quebec’s boreal forest have a below average berry crop. Flocks will likely wander farther south and east than usual. Watch for them feeding on European Mountain‐ash berries, small ornamental crabapples and Buckthorn berries. Swirling flocks of Bohemian Waxwings resemble starlings and make a continuous buzzy ringing twittering. ACKNOWLEDGMENTS: I thank staff of the Ontario Ministry of Natural Resources and Forestry, and the many birders/naturalists whose tree seed reports allow me to make annual forecasts: Dennis Barry (Durham Region, Haliburton, Gogama ON), Angus Baptiste (Grand lac Victoria QC), Eleanor Beagan (PEI), Joan Collins (Adirondacks NY), John Cordon (Flin Flon MB), Pascal Côté (Observatoire d'oiseaux de Tadoussac QC), Bruce Di Labio (Eastern ON), Charity Dobbs (Ontario Tree Seed Plant), Cameron Eckert (Whitehouse YK), Dave Elder (Atikokan ON), Bruce Falls (Brodie Club, Toronto), Marcel Gahbauer (Eastern ON), Bill Gilmour (Presqu’ile Provincial Park ON), Michel Gosselin (Gatineau QC), David Govatski (NH and VT), Leo Heyens (Kenora ON), Tyler Hoar (James Bay, Rainy River ON and Laurentians QC), Kris Ito (French River ON), Jean Iron (James Bay & Northeastern ON), Bruce Mactavish (Newfoundland), David McCorquodale (Cape Breton Island NS), Clayton D'Orsay (Cape Breton Island NS), Larry Master (Adirondacks NY), Ken McKenna (NS), Stacy McNulty (Adirondacks NY), Brian Morin (Cornwall ON), Andree Morneault (Nipissing District ON), Brian Naylor (Nipissing District, ON), Marty Obbard (Peterborough & Hudson Bay Lowlands ON), Stephen O’Donnell (Parry Sound District ON), Justin Peter (Algonquin Park ON, Gatineau Park QC, Edmonton AB, Vancouver BC), Fred Pinto (Nipissing District ON), Rayfield Pye (Newfoundland), Brian Ratcliff (Lake Superior & Northern ON), Ron Tozer (Algonquin Park ON), Declan Troy (AK), Mike Turner (Haliburton Highlands ON), Mary Beth Warburton (Adirondacks NY), Angie and Ken Williams (Smooth Rock Falls ON), Matt Young (NY) and Matt also shared his knowledge of Red Crossbills. Michel Gosselin and Jean Iron proofed the forecast, and Jean hosts the forecast on her website. 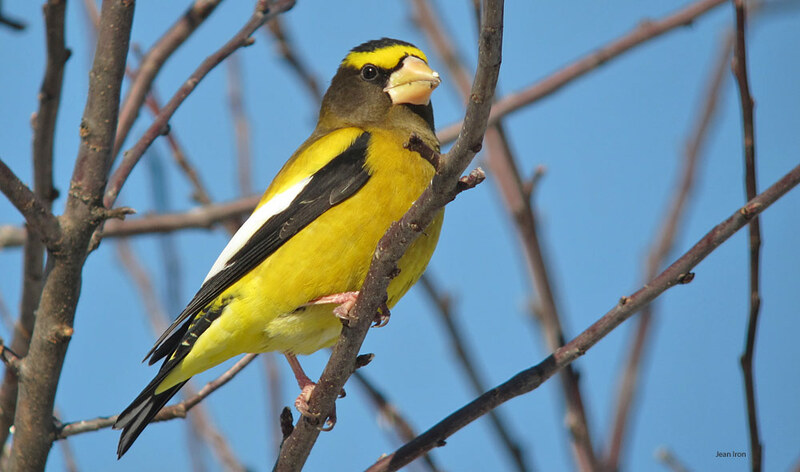 Follow finches this fall and winter on eBird. 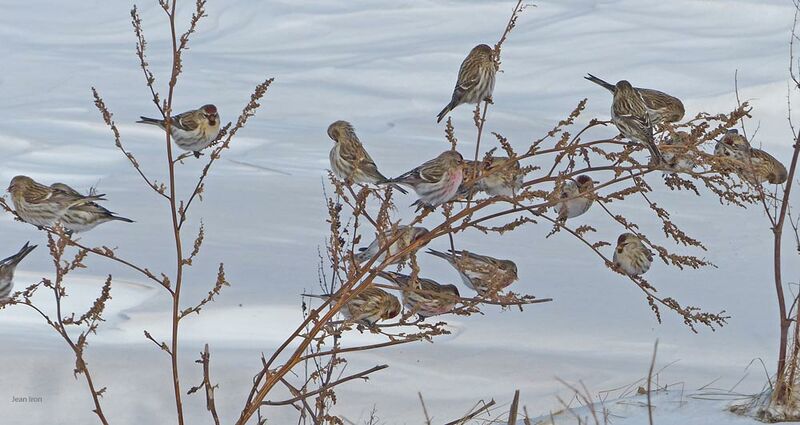 Common Redpolls feeding on weed seeds.